I really enjoyed several of the stories in this anthology. Given that there were stories by so many different authors, I’m just going to go through them as they come in the book. This was an interesting take on how society would react to telepaths. As humans we often seek to control what we do not understand and this story is a good indication of that tendency. There are several things to consider when discussing the possibility of telepathy. One of the primary things to consider is that a person’s ability to lie to another would be greatly impeded. Additionally, to be an accepted part of society telepaths would need to limit themselves with regard to individual privacy of those they encounter. As with anything new, fear is often the precursor of understanding and this story does a good job of showing that. As readers of Peter Cawdron’s stories have come to appreciate, this story does not end as one would expect. It was a good kickoff to the anthology and put me in the right mindset for the stories to follow. This was a mystery as well as a telepath tale with several twists and turns. Dr. Celine Bent unexpectedly finds herself in an unusual situation as she tries to save a young girl in this story. Nothing is as she expects and the experience throws her for a loop for lack of a better explanation. County Sheriff Albert Contardo turns to Dr. Bent for help with the investigation. The revelations to come are intriguing. I enjoyed this story. I wasn’t surprised by the ending, but the writing was good it was a sign of good things to come as the second story of this anthology. Cora is an easy character to follow through this story. When we meet her, she has been a test subject for years and has willingly complied with the testing and limitation of her freedom. However, this attitude changes when Cora finds out that the end goal of those who care for her is to breed a stable telepath that can operate in the real world. An unexpected escape attempt by an outside group thrusts Cora into the center of the action when they decide to help her escape. Along the way Cora has to determine who to trust and whether she is safer as an escapee or a patient. Kelli Erickson is a different sort of character, kind of apathetic with her overall regard of the world. She sleeps when she wants, enjoys delving into her dreams more than going our or making friends, has a job that accommodates her changing view on how much sleep she needs and is just an all around stay-at-home type. During one of her napping sessions Kelli’s peaceful snoozing is interrupted unexpectedly. What Kelli uncovers in between her naps may determine the course of the rest of her life. I don’t want to spoil the story so we’ll just have to leave it at that for this one. This was a good all around science fiction story. 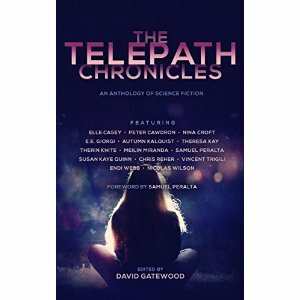 The telepathy was a major part of the story’s backdrop, but the real story here was about personal acceptance and fear of the unknown. I really enjoyed the character study that took place here and feel the author did a good job of exploring not only the fears of those who might encounter a telepath, but also of the telepath herself and what she fears her capabilities may actually be. The author put forth an interesting concept here. If the world were full of telepaths then there would most likely be some desire to protect oneself from their intrusions, especially for more unsavory dealings. This story takes us into the underworld of crime with Zeph, a mindjacker who locks and unlocks minds for a local gang. Zeph has a lot of decisions to make during this story and it was certainly a unique perspective. This was an interesting tale with some real world things to think about. Imagine that a major military leader has information in his head that can save the day and you’ll be on the right track for this story. I don’t want to ruin the story. This is a pretty short slice of life tale with lots to think about. I really enjoyed this story. It was an unexpected bonus for me in the book. Mick Grayson, head of Grayson Dynamics, is taking mankind on a one-way trip while he feeds his own sense of self-importance. Along comes someone to save the world from Mick and what a formidable enemy she is. This isn’t only a story about telepathy, but about artificial intelligence as well and was definitely a page turner. Aside from Therin Knite’s blog I hadn’t really read any of this author’s work, but was well pleased with this story and may go hunt down some more because of it. This is definitely an action-packed tale that was fleshed out nicely. If you enjoy stories that not only make you think, but also keep your pulse going then this might just be a story for you. This is a pretty emotional story. Geneticist Avia Sherman is pretty much involved in her own world of personal grief and desperately continuing research to help humanity. Along the way she is asked to consult on another case involving a young girl. What seems like an interruption may be the key to unlocking secrets that Avia desperately needs to continue her work. The Null was a little bit darker tale of an operative with an interesting version of telepathy. 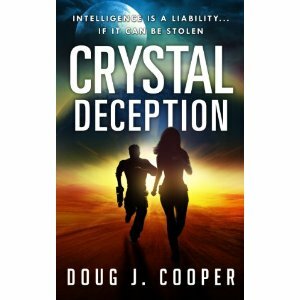 I enjoyed this story and found myself following right along with the main character as he made his way through. Our character teams up with an unlikely character to complete his mission and protect his family. Once again, too short of a tale to give too much detail, but I enjoyed the story and the character. I enjoyed this story, but the tone reminded me of the Darkover series right off. I don’t know if that is fair or not, but that’s what it made me think of…that and Captain Jack Sparrow’s moving rocks from the Pirates of the Caribbean movies. I liked the story, but was a little distracted by my own thoughts of other stories and movies that this tale brought to the forefront as I read. You’ll have to decide about this one on your own. Cyann is a great character. I really enjoyed the childish enthusiasm of this character. Cyann is a hybrid between humans and the Delphi. She is a very engaging character and this story was easy to enjoy. There’s some telepathy going on here, but there is a greater mystery that I would like to delve into with regard to this story. There is a completely unknown character involved in this story that is helping Cyann along. That is the character I want to know more about. There is a word from the author at the end of each of these stories and I have to agree with Chris Reher that space opera is about people. The author did a great job of showing the people in this story. This story explores the inability of normal people to lie to telepaths. The normal humans in this story have developed a workaround for this problem, but when they start employing that workaround more and more questions arise for the telepaths working with them. What information are the others trying to hide from the telepaths and how will that affect them all going forward? This isn’t too long of a story. There is no original science fiction, but as there have been several different series that covered many of these elements I wasn’t at all surprised by the ending. Some elements of this story have been used from Dune to Futurama and I saw where it was leading pretty quickly. This was a really intriguing look at how society would develop and react to the advent of telepathy in everyday life. This particular tale caught and kept my attention right to the very end. I don’t want to spoil the overall story, but imagine being one of the few people in the world who cannot communicate with telepathy and how that would put you on the outside of society’s norms. It’s an interesting way to look at a fictional situation that is all too real when it comes to deaf and mute members of our society, especially with regard to language and the different ways we communicate. That’s a wrap for today. I have lots going on as we head toward the holidays, but am still plugging along on my reading list. We have Thanksgiving here in America next week so I plan to spend several days reading and lounging with my family. I’ve made some progress on the backlog and anticipate I might even get caught up before too long. Hopefully, I’ll make some progress on that over the holiday. Always feel free to contact me if you’re interested in having your book reviewed. In the mid 21st century, scientists have mastered genetic engineering nearly to the point where longevity and charisma can be bought and sold. But a few pieces to the puzzle are missing and believed to reside in the DNA of a select few who have managed to stay hidden for centuries. Whoever finds the genetic key to eternal youth will have wealth and power beyond imagining. Edana “Danny” Reyes is a regular teenage girl dreaming about college and pining for someone who doesn’t love her back. Until a mysterious man shows up, a man with almost magical charm that affects everyone around him. Danny learns about her fey heritage and why she must keep it secret from the scientists scouring the earth, scientists who aren’t above killing to get the answers they seek. With the help of her best friend Cassidy and new allies, Danny must protect herself from those who would stop at nothing to take everything from her. This book really wasn’t for me. In fact, I couldn’t make myself finish it. That doesn’t mean it was all bad. The author is clearly intelligent and did a great deal of research regarding Celtic lore and genetics. The text was well-written and flowed with ease. As for the story, some of it was fairly interesting. I enjoyed the portions of the story that had to do with the lore and even the genetics and how it all tied in. However, I think the audience for this book would be pretty young despite the characters being in college. They seemed more like high school kids with regard to their behavior. Maybe its been too long since I’ve been young and I just can’t tell the difference anymore, but the characters were not mature enough for my liking and lost their appeal for that reason. Another problem with this book is that there was so much focus on the sexual orientation of the various characters, discussions between them all about this on a regular basis and so on that I really became disenchanted with the book. I’m pretty liberal, but I don’t know any group of people who discuss their sexual orientation almost every time they meet up and it just got to be a bit much. Once you discuss this with your friends it’s pretty much a done deal. Everyone knows how you are inclined and you move on if you’re really friends. I think the author covered the whole LGBT spectrum, but I didn’t feel that it added anything to the story in the manner it was done. There were some good points to this book, but eventually I just became uninterested in the story. I stopped at 54% on the e-reader file and the last 15% leading up to that point it was really a struggle for me to keep going. Some of you may enjoy this story. For me, the characters were too immature, too much time was spent discussing sexual orientation and this focus overshadowed what I felt to be the more interesting story that was being told. We all enjoy different types of stories. This one just wasn’t for me. However, the science was well done and sometimes a bit too well done to the point where it became like a biology lesson. The research and sharing of the lore was also pretty interesting and the writing was good. In the end it was the story wandering off and the maturity level of the characters that lost my interest. That’s all for today. Reading an interesting book now that I hope to share some thoughts on later in the week. Hope everyone had a great Halloween.